"What we wanted to do, fundamentally, is take Dragon Age: Origins and give the franchise a shot of adrenaline." Lead designer Mike Laidlaw's statement shouldn't come as much of a shock -- all of the marketing materials and crunchy riffs have said as much. But fans of BioWare's successful 2009 RPG shouldn't fear a repeat of Prince of Persia: Warrior Within. The aesthetics have changed, the battles system has been altered, but a familiar formula still operates beneath the surface. Bioware tasked itself with improving three elements in this sequel: the story, the graphics and the combat. The development team knew it wanted to move away from the central figure of the Grey Warden, while adding to the saga that began in Origins. They adopted a framed tale -- a prologue and three acts spanning 10 years in the game world -- and the life of the new protagonist, Hawke, is told from the perspectives of two other characters. "We didn't want to just retread the same road," Mike Laidlaw says. "To me, the Dragon Age franchise isn't about a single character or a single conflict, it's about a period of time in a world." More obvious and significant than the story are the changes made to the graphics and combat. While it might appear to run on a new engine, Dragon Age 2 employs an evolved version of Origins' Eclipse engine (now called the Lycium engine internally). Gameplay designer Dan Lazin tells me the different look was achieved not only through the improved graphical features of the engine, but also in the types of art assets crafted for it. "The art style is a bit more distinct -- stylized yet still realistic," Lazin says. Dragon Age 2 looks brighter and its environments seem far more alive -- it's a quasi cel-shaded look that really makes the game pop and will offer better consistency across all platforms. 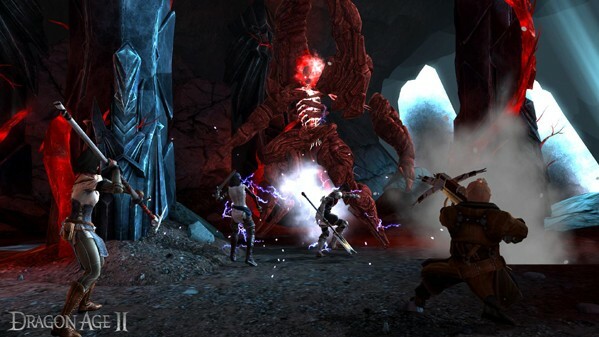 "Consoles on Dragon Age: Origins were left behind a little bit," Lazin admits. "You could tell the art had been created primarily for PCs and that we'd done what we could to make it work for consoles, but now it looks great across all three platforms." Lazin promises that the game be up to snuff on consoles, and even look better than on most mid-ranged PCs. You'll still have access to the graphical bells and whistles on a more powerful PC, of course, and still have the ability to zoom out the camera. A night-cloaked Kirkwall, the central city of Dragon Age 2, served as a good demonstration of the game's enhanced technology. I moved between distinct neighborhoods and sections, each with their own feel -- the elvish district's central area featured a large, magical tree, its glowing roots thrusting up from the ground and stealing the scene as I was ambushed by a group of knights. Like the beginning portion of the game, this encounter was merely a taste of the tougher battles to come. At first glance, Dragon Age 2 feels closer to an action-adventure, with a button press triggering an immediate attack on screen. In these smaller skirmishes, the game can feel quite different from Origins and even a little mindless. According to Mike Laidlaw, the goal is for players to "fight like a spartan, but think like a general," and as I made my way through a dark crypt, eventually encountering a big stone wraith, I was forced to abandon my careless ways. I switched between characters, healing and casting buffs when appropriate, and brought the creature down after a grueling battle. In this fight, I felt familiarity and knew that the core Origins experience hadn't been lost in the sequel. Additionally, Lazin promises a better tutorial system explaining the combat. Frequent pop-ups will help aid those who skip the manual -- though seeing as he wrote the thing, he obviously doesn't recommend that you do so! The autosave system in Origins also drew some ire, as it demanded players constantly save on their own lest they find themselves losing quite a bit of progress. Lazin tells me it was "one of the first things on the to-do list" for the sequel. "Fixing autosaves wasn't really that hard, so we just did it really early. And that was a no-brainer -- every time you transition between areas, we have a lot more autosaves and before major fights. We also have a third autosave for every time the story jumps ahead in time." As it leaps into Dragon Age 2, Bioware is asking you to come back -- after investing so much of yourself and your time in the Grey Warden -- to uncover new parts of the world and interact with a new cast of characters. Based on the (admittedly) short amount of time I've spent with Dragon Age 2, I think the changes made to the combat and structure will be welcomed, and that fans will have little trouble finding their new origins in Hawke's tale.